1. Defrost the spinach in a small pan with lid on a low heat. 2. In the meantime, dice the tomatoes. Heat a pan with oil and fry the tomatoes for 2 minutes. 3. 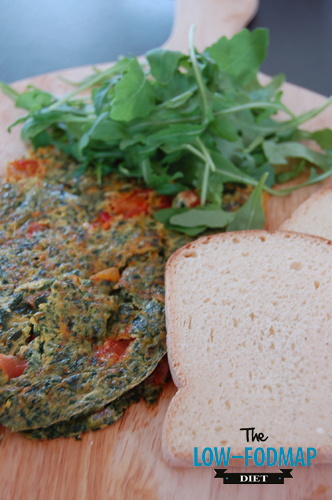 Beat the eggs in a bowl, add the spinach and mix it well. 4. Divide the tomatoes in the pan and pour the egg mixture over it. 5. Fry the egg on medium heat and flip after 4 minutes and fry the other side for 1 minute. 6. Season it with some salt and pepper. Delicious on bread with some rocket salad!